It takes a mere 90 minutes to drive from Montreal's Dorval airport to Tremblant. The scenic road winds through the Laurentian Mountains toward what is best known as North America's second oldest ski resort. But in summer and fall, grass covers the slopes, which funnel down through green forests to an animated alpine village crammed with shops, restaurants, pubs, hotels, and condominiums. That pedestrian village is the centerpiece of the resort in all seasons of the year, of course, but it seems especially lively in summer, when street theater and concerts take place on its plazas and vacationers throng its outdoor cafes. Although the ski resort itself dates to the late 1930s, most of this development has occurred over the last decade after Intrawest acquired the resort and invested some $800 million Canadian dollars in its enhancement. 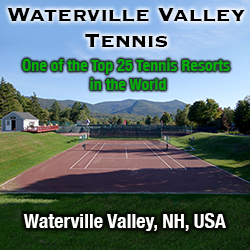 That development included a new Beach & Tennis Club on the shores of Lake Tremblant. This attractive complex has 13 clay courts, some of them just steps from the beach. André Lemaire oversees the facility under his umbrella International Academy, which is now also offered on the 12 Har-Tru courts at la Belle Golf Course at nearby Gray Rocks (though the historic hotel there is now closed). His staff offers a range of programs, from group and private lessons to clinics, junior day and overnight camps, round robins, and occasional tournaments. Tennis aside, there is an abundance of other recreation. Intrawest added two golf courses at the resort, supplementing those at Gray Rocks. Couple that with such other traditional Laurentian Mountain activities as horseback riding, hiking, rock climbing, fishing, watersports on the lake, and more than 100 miles of mountain-bike trails and you have the recipe for a complete vacation in one place. Rates vary with the type of accommodations which range from hotel rooms, many with fireplaces, to fully equipped 2- and 3-bedroom homes. Seasons. Mid-May to early October for tennis. General Tourist Information. For information about touring the Laurentians, see the Laurentides section of the Quebec Government Tourism Site or contact Tourism Québec, P.O. Box 979, Montréal, Qué., h3C 2W3, CANADA; phone toll-free at 877-266-5687 or fax: 514-864-3838.